That moment of pride when you just compared pus to butter, and now the whole world can understand texture in a new way. 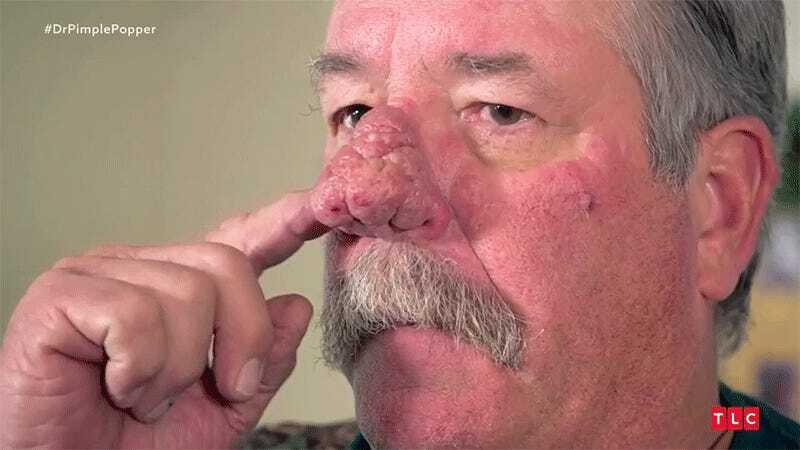 Condition: The most extreme case of rhinophyma that Dr. Pimple Popper had ever seen. Patrick reported he started developing a wicked case of rosacea about 15 years ago, after decades of construction work in the sun. About 10 is when his nose swelled up into the hamburger-like state it was in when he approached Dr. PP. Through tears, Patrick’s wife reported that his nose scared children. Anyway, in a similar, though already more prolonged, process, I get what “popaholics” see now when they watch stuff like this. The removal of Patrick’s rhinophyma didn’t gross me out at all—and while it didn’t satisfy me, per se, I completely understand why someone would find this satisfying. It’s something like clearing a field with a scythe. The nose itself was just layer upon layer of pus and sebum ticked in nooks and crannies, as though Patrick’s nose were the creamiest English Muffin in history. Wring out that muffin!!! The tool Dr. PP used is called a loop electrocautery, which sends an electric current through a loop to make shaving off errant skin growths a snap. I want one. No but for real, the most satisfying thing about this episode was the almost complete restoration of Patrick’s nose. I know Dr. Lee is a doctor, who takes you through her various diagnoses and processes she performs her extraction and detachment procedures, but this still seems like sorcery to me. In terms of this week’s food metaphors, we had multiple kinds of butter, bacon bits, and, in a bit of an analogous reversal, an office discussion about making food that looks and pops like the various growths that Dr. Lee removes. A gross way of realizing a gross linguistic tendency, how innovative. I also would like to point out that before this episode, there ran an ad for the Dr. Pimple Popper Super Bowl Sunday programming that took Naughty by Nature’s 1991 smash “O.P.P.” and converted it to “D.P.P.” That, of course, stands for Dr. Pimple Popper. I support everything Dr. Pimple Popper does. I think she’s a gem who legitimately improves people’s lives. But I also think everyone should relax for just, like, a minute or two.